This complete starter kit from Ryobi includes 3 of the most useful cordless tools. Part of the very popular Ryobi one system, this kit includes everything needed in one large carry case. 18V Combi Drill - LCDI1802M. Chuck that easily secures bits with the chuck jaws but also has a 1/4 in. collet so you can quickly attach a hex bit. of torque for the most demanding applications. The 7-1/4 in. Brushless Circular Saw that has a 0-56° bevel cut capacity so you can cut the most common and complex angles. This 4 piece combo kit from Ryobi is the ideal kit for anyone looking for a comprehensive tool kit to suit almost every application! The impact driver is ideal for repetitive screwdriving tasks and makes even large decking screws an easy fix! • Battery Type: Ryobi ONE Lithium Ion. • Ryobi ONE 18v 2.0ah Lithium Ion Battery (x2). • R18PD5 Cordless Combi Drill. • R18IDBL Cordless Impact Driver. • R18CS7 Cordless 184mm Circular Saw. • R18RS7 Cordless Reciprocating Saw. This do-it-yourself RYOBI Super Combo is full of 18-Volt ONE lithium-ion tools that will turn chores into hobbies. The variable-speed reciprocating saw in this bundle includes a blade with a 7/8 in. • R18PD3 Combi Drill. • Batteries are fully compatible with the rest of the Ryobi ONE range. • Impact driver for high torque screwdriving. • RID1801M Impact Driver. • Compact, lightweight and ergonomic for comfortable handling. Condition is New. chuck that easily secures bits with the chuck jaws but also has a 1/4 in. collet so you can quickly attach a hex bit. of torque for the most demanding applications. The 7-1/4 in. The drill/driver includes a 1/2 in. heavy-duty single sleeve and a keyless chuck with 24-position clutch to match your drilling and driving needs. The impact driver has a variable-speed trigger and 1600 in. This kit provides a variety of tools to get all of your projects done. Backed by the RYOBI 3-Year Manufacturer's Warranty, this RYOBI 18-Volt combo kit includes a 7-1/4 in. Miter Saw, Impact Driver, Drill, 5-1/2 in. RYOBI tool kits are designed to help you get optimum performance. The carrying bag lets you keep everything conveniently in one place. Ability to hook up to a wet/dry vacuum hose (not included) for dust collection. RYOBI introduces the18-Volt ONE Lithium-Ion Cordless 3-Tool Lighting Kit with Cable Lights, Spotlight, and LED Light (Tools Only). Backed by the RYOBI 3-Year Manufacturer's Warranty, this kit includes cable lights, a spotlight, an LED Light, and operator's manuals. This do-it-yourself RYOBI Ultimate Combo Kit is chock-full of 18-Volt lithium-ion devices that will turn chores into hobbies. The variable-speed reciprocating saw in this bundle includes a blade with a 7/8 in. Ryobi combo kits were designed to help you get optimum performance out of your tools. A convenient, cordless design eliminates hassles associated with cords tangling and long-reach plug-ins. This lightweight, powerful kit will help you power through the toughest of jobs. This tool kit has little to no use. This circular saw is still secured with zip ties. This product is kept in our indoor storage. I had this as a backup kit if any of my tools broke back when but have since upgraded to an 18v setup. The Ryobi 18-Volt ONE Drill/Driver Kit provides superior lithium-ion performance to get the job done. The drill includes a 1/2 in. heavy-duty single sleeve and a keyless chuck with 24-position clutch to match your drilling and driving needs. Model # P884. Seldom has a comprehensive cordless tool kit been so affordable! This do-it-yourself Ryobi ultimate combo is chock-full of 18-Volt lithium-ion devices that will turn chores into hobbies. Of torque for demanding applications. All of these tools work with RYOBI 18-Volt ONE batteries, which support more than 125 superb RYOBI tools. Includes: (1) P252 brushless drill/driver with screwdriver bit, (1) P239 brushless impact driver and bit, (1) P423 brushless 4-1/2 in. Chuck that easily secures bits with the chuck jaws but also has a 1/4 in. collet so you can quickly attach a hex bit. of torque for the most demanding applications. The 7-1/4 in. Brushless Circular Saw that has a 0-56 bevel cut capacity so you can cut the most common and complex angles. This kit provides a variety of tools to get all of your projects done. Backed by the RYOBI 3-Year Manufacturer's Warranty, this RYOBI 18-Volt combo kit includes Cordless Miter Saw, Drill, 5-1/2 in. Batteries: 1.5 Ah lithium-ion batteries provide fade free power and compatible with all 18-Volt ONE tools. Ships Within 24 Hours, 60 Day Hassle Free Returns!!! The variable-speed reciprocating saw includes a blade with a 7/8 in. stroke length capable of 3,100 SPM. For high-torque fastening jobs, turn to the impact driver for spinning lag bolts and deck screws. RYOBI introduces the 18-Volt ONE Lithium-Ion Cordless Brushless 2-Tool Combo Kit. Circular Saw and Brushless Drill/Driver. The 7-1/4 blade on the Brushless Circular Saw provides a 26% increased cut capacity and blade variety. 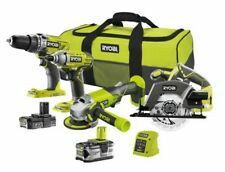 Ryobi P1874 18-Volt ONE+ Lith-Ion Cordless Combo Kit (3-Tool) FREE SHIP NISB! 18-Volt ONE Lithium-Ion Cordless Combo Kit (3-Tool). MODEL NUMBER=P1874. Ryobi combo kits were designed to help you get optimum performance out of your tools. A convenient, cordless design eliminates hassles associated with cords tangling and long-reach plug-ins. New in box Brushless combo set. Nice set for the money. Feel free to ask questions. Circular saw has ergonomically designed handle with over mold to increase user comfort. Circular saw has a left side blade that provides improved cut line visibility. Drill features a 24 position clutch and 2-speed gear box to match your drilling and driving needs. Includes: (1) P252 brushless drill/driver with screwdriver bit, (1) P239 brushless impact driver and bit, (1) P423 brushless 4-1/2 in. with an integrated 1/4 in. collet for fast and easy bit changes. Drill/Driver: 2 speed settings (0-440 RPM or 0-1600 RPM), variable with a spring-loaded trigger. Reciprocating Saw: Features tool-free blade change. Cordless Tool Type. Lithium Ion. Cordless/ Corded. New and improved GRIPZONE overmold for optimum grip and user comfort onboard bit storage for user convenience. Drill: 24-position clutch and 2-speed gearbox (0-440 RPM and 0-1600 RPM) to match your drilling and driving needs. This kit provides a variety of tools to get all of your projects done. Backed by the RYOBI 3-Year Manufacturer's Warranty, this RYOBI 18-Volt combo kit includes Cordless Miter Saw, Drill, 5-1/2 in. RYOBI Cordless 5-Tool Combo Kit 18-Volt ONE Lithium-Ion. For sale Ryobi One P825.